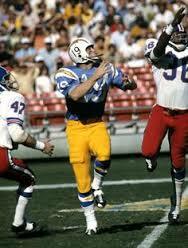 Chargers Copyright “L.A. Chargers” – What Does it Mean? “Approval of the applications can take several months, and if the Chargers don’t use the marks within six months after the team is granted approval, the applications would be considered abandoned. But that timeframe can be extended multiple times, Saivar said. So even if the Chargers don’t decide to move to LA immediately, the trademark applications could prove helpful to the team down the road. 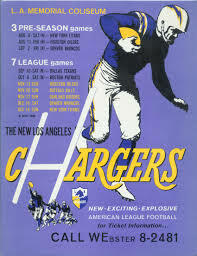 If you have read my book you know that the Chargers were one of the original eight 1960 American Football League franchises and were based in Los Angeles before moving to San Diego the next year. Not sure if they will move back to L.A. or not but one thing is for sure: those powder blue uniforms with the lightning bolts are among the best in the history of the NFL! That’s it for now football fans. Referees Have the Hardest Job in the World – Let’s Help Them! Run-Pass-Option: The Oldest Play in the Book! When Will Jerry Kramer Get His Due?